فلزات سنگین یکی از آلاینده‌های محیط زیست است که امروزه تلاش زیادی برای حذف آن انجام می‌‌شود. در این پژوهش، خاک اره اصلاح شده با دی‌اتیلن‌تری‌آمین به‌عنوان یک جاذب مؤثر به‌منظور حذف آهن (III) از نمونه‌های آبی، مورد بررسی قرار گرفت. در ابتدا خاک اره توسط دی‌اتیلن‌تری‌آمین اصلاح شد. آنالیز SEM نشان داد که سطح ذرات در اثر اصلاح تغییر یافته است. سپس فاکتورهای مؤثر بر فرایند حذف، از قبیل pH محلول، دز جاذب، زمان تماس و دور شیکر بهینه شدند. شرایط بهینه برای غلظت‌های مختلف آهن بین 20 تا 300 میلی‌گرم در لیتر به‌کار برده شد؛ در تمام حالات، میزان حذف قابل توجه بود. در شرایط بهینه بیش از 3/0 ± 95 درصد آهن به غلظت 50 میلی‌گرم در لیتر با به‌کارگیری دز جاذب 5/1 گرم در لیتر در مدت زمان 15 دقیقه حذف شد که نشان دهنده ظرفیت بالا و عملکرد سریع جاذب در حذف آهن است. 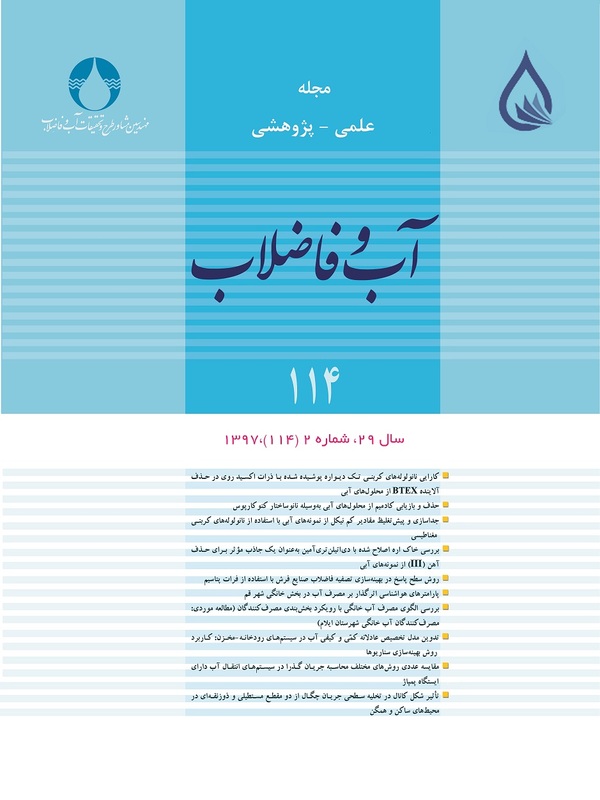 داده‌های جذب تعادلی با استفاده از مدل‌های ایزوترمی لانگمیر و فروندلیچ بررسی شد. داده‌های تعادل جذب سطحی به‌خوبی با همدمای لانگمیر مطابقت داشت. بیشینه ظرفیت جذب تعادلی لانگمیر معادل 200 میلی‌گرم در گرم برآورد شد. بر اساس نتایج آزمایش‌ها، سینتیک فرایند جذب با مدل سینتیک شبه مرتبه دوم مطابقت بیشتری داشت. این روش به‌طور موفقیت‌آمیزی برای حذف آهن (III) از آب شرب شهری، آب چاه، آب رودخانه و پساب صنعتی کاربرد دارد. Heavy metals are environmental pollutants that nowadays a lot of efforts are made to remove them. In this research, the sawdust modified with diethylenetriamine as an effective adsorbent for Fe (III) removal from water samples was conducted. First, the sawdust was modified by diethylenetriamine. SEM analysis showed that the particle surface is changed by modification. Then the effective factors in Fe (III) removal such as pH, adsorbent dose, shaker speed and contact time were studied and optimized. The optimum conditions were employed for various Fe (III) concentrations (20–300 mg L-1) and in all cases, the removal rate was significant. The adsorbent has high capacity for Fe (III) removal in a way that it removed more than 95.0±0.3 % of Fe (III) (50 mg/L) by 1.5 g/L of adsorbent in 15 minutes. The Langmuir and Freundlich isotherms were applied to the adsorption process and their constants were evaluated. The adsorption equilibrium data fitted well to Langmuir isotherm. The maximum Langmuir adsorption capacity of Fe (III) ions was 200.0 mg/g. According to kinetics experiments of Fe (III), the adsorption process had more conformity to pseudo-second-order kinetic model. This method was successfully applied for Fe (III) removal from potable water, well water, river water and industrial wastewater samples. Aboul-Magda, A.A.S. & Al-Haddad, O.A., 2012, "Kinetics and mechanism of ion exchange of Fe3+, Cd2+ and Na+/H+ on Lewatite S-100 cation exchanger in aqueous and aqueous-detergent media", J. Saudi Chem. Soci., 16, 395-404. Ahmed, S.A., 2011, "Batch and fixed-bed column techniques for removal of Cu(II) and Fe(III) using carbohydrate natural polymer modified complexing agents", Carbohyd. Polym., 83, 1470-1478. Bhattacharyya, K.G. & Gupta, S.S., 2008, "Adsorption of Fe(III), Co(II) and Ni(II) on ZrO–kaolinite and ZrO–montmorillonite surfaces in aqueous medium", Colloid Surface A, 317, 71-79. Bhattacharyya, K.G. & Gupta, S.S., 2009, "Calcined tetrabutylammonium kaolinite and montmorillonite and adsorption of Fe(II), Co(II) and Ni(II) from solution", Appl. Clay Sci., 46, 216-221. Habiba, U., Afifi, A.M., Salleh, A. & Chin Ang, B., 2017, "Chitosan/(polyvinyl alcohol)/zeolite electrospun composite nanofibrous membrane for adsorption of Cr6+, Fe3+ and Ni2+",Journal of Hazardous Materials, 322, 182-194. Han, R., Ding, D., Xu, Y., Zou, W. & Wang, Y., Li, Y. & Zou, L., 2008, "Use of rice husk for the adsorption of congo red from aqueous solution in column mode", Bioresource Technol., 99, 2938-2946. Kasim, N., Mohammad, A.W. & Sheikh Abdullah, S.R., 2016, "Performance of membrane filtration in the removal of iron and manganese from Malaysia's groundwater", Membr. Water Treat., 7(4), 277-296. Khalil, M.M.H., Al-Wakeel, K.Z., Abd El Rehim, S.S. & Abd El Monem, H., 2013, "Efficient removal of ferric ions from aqueous medium by amine modified chitosan Resins", J. Environ. Chem. Eng., 1, 566-573. Kumar Rana, V., Selvaraj, M., Parambadath, S., Chu, S.W., Park, S.S., Mishra, S., et al., 2012, "Heterocyclic tri-urea isocyanurate bridged groups modified periodic mesoporous organosilica synthesized for Fe(III) adsorption", J. Solid State Chem., 194, 392-399. Marcu, C., Axente, D. & Balla, A., 2016, "Study of Fe(III) adsorption onto Dowex-Marathon resin, as a rate determining step of the U(IV) oxidation in 235U enrichment column", Journal of Radioanal. Nucl. Chem., 308, 179-185. Middea, A., Fernandes, T.L.A.P., Neumann, R., Gomes, O.F.M. & Spinelli, L.S., 2013, "Evaluation of Fe(III) adsorption onto palygorskite surfaces", Appl. Surf. Sci., 282, 253-258. Namdeo, M. & Bajpai, S.K., 2008, "Chitosan–magnetite nanocomposites (CMNs) as magnetic carrier particles for removal of Fe(III) from aqueous solutions", Colloid Surface A, 320, 161-168. Natkański, P., Kuśtrowski, P., Białas, A., Piwowarska, Z. & Michalik, M., 2013, "Thermal stability of montmorillonite polyacrylamide and polyacrylate nanocomposites and adsorption of Fe(III) ions", Appl. Clay Sci., 75-76, 153-157. Orakwue, E.O., Asokbunyarat, V., Rene, E.R., Lens, P.N.L. & Annachhatre, A., 2016, "Adsorption of iron(II) from acid mine drainage contaminated groundwater using coal fly ash, coal bottomAsh, and bentonite clay", Water Air Soil Pollut., 227, 74-86. Oztas, N.A., Karabakan, A. & Topal, O., 2008, "Removal of Fe(III) ion from aqueous solution by adsorption on raw and treated clinoptilolite samples", Micropor. Mesopor. Mat., 111, 200-205. Papassiopi, N., Vaxevanidou, K. & Paspaliaris, I., 2010, "Effectiveness of iron reducing bacteria for the removal of iron from bauxite ores", Miner. Eng., 23, 25-31. Soliman, E.M., Ahmed, S.A. & Fadl, A.A., 2011, "Reactivity of sugar cane bagasse as a natural solid phase extractor for selective removal of Fe(III) and heavy-metal ions from natural water samples", Arab. J. Chem., 4, 63-70. Ucer, A., Uyanık, A., Cay, S. & Ozkan, Y., 2005, "Immobilisation of tannic acid onto activated carbon to improve Fe(III) adsorption", Separat. Purif. Technol., 44, 11-17. Vasudevan, I. S., Jayaraj, J., Lakshmi, J. & Sozhan, G., 2009, "Removal of iron from drinking water by electrocoagulation: Adsorption and kinetics studies", Korean Journal of Chem. Eng., 26(4), 1058-1064. Wang, M., Xu, L., Zhai, M., Peng, J., Li, J. & Wei, G., 2008, "γ-ray radiation-induced synthesis and Fe(III) ion adsorption of carboxymethylated chitosan hydrogels", Carbohyd. Polym., 74, 498-503.